Pablo Amaringo was elected to the Global 500 Roll of Honor of the United Nations Environmental Program in recognition of outstanding practical achievements in the protection and improvement of the environment through the USKO-AYAR school. 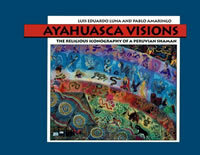 28:02 Pablo begins talking about the ayahuasca visions in his paintings. 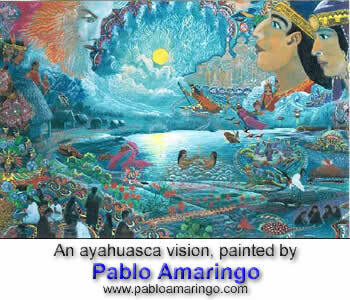 Posted in Art, Ayahuasca, Creativity, Culture, Pablo Amaringo, Shamanism and tagged Art, Ayahuasca, Creativity, Culture, Pablo Amaringo, Shamanism. This was not translated exactly in the things Pablo had to say. He several times refered to his not being able to believe as a child of the Spriit World as interpretpreted through the Catholic influences which dominated his culture. A number of things, some small some larger, were not transposed as Pablo intended them. The translator filled in a lot from his own library of understanding. No harm done. It’s just that a more fluent Spanish/English speaker could have done a more precise job, and a more interesting one too. This was a great talk by Pablo Amaringo; I’d never heard him speak before, and I thank you so much for that. However, the “translator” was terrible. Pablo didn’t say but a fraction of what was said in English by this fraud of a “translator,” and seemed to have his own agenda, or perhaps his knowledge of Spanish was just so poor that he had to make up whatever he thought Pablo was saying. Or maybe he had an ego problem and felt that sharing the stage, posing as a translator, wasn’t glorious enough, so he tried to usurp the place of the man everyone came to hear speak. I have no idea what his problem was. I’m just thankful that I could understand exactly what Pablo said. But seriously, Lorenzo, I think that some notice or caveat should be given in the introduction of this podcast that the “translator’s” words are not even close to the same as Pablo’s. Wow, what a cool talk. The interpreter seems to not catch the subtlety of this and rather says something about the brew being sacred (which Pablo also says). It’s a really minor observation, and I may have heard it wrong, but I thought it might be interesting to some people. Anyway, awesome show, and thanks a ton Lorenzo for getting something out before the Burn. By the way, let those of us who aren’t going know what the affects are of this year’s “marketing experiment” at Burning Man. After seeing the new in-video ads on YouTube debut today, I don’t know if any of us can stomach advertising creeping this far into our small corner of the culture. Thanks for the kind words . . . I was missing the salon too :-).
. . . AND in October I plan on starting a new channel with Bruce as my first guest! I should have done this a while ago, and actually should have been the first thing to do once Lorenzo had given me permission to “jump start” his myspace. But better late than never hopefully applies here. So for us saloners out there who have myspace please join the Psychedelic Salon on myspace at myspace.com/psychedelicsalon. Personally I like it because I have added it to my top friends and love doing what I can to promote this good thing here. And I can’t wait to possibly get involved with the dopecast forum or is it just the growreport forum to discuss psychedelics. I had made the attempt to register but where it had asked for who had directed me towards signing up, I want to put Lorenzo in that box and it wouldn’t let me, so maybe Lorenzo if you’re reading this you might help. But I understand if putting on web discussions is too much, you’ve introduced me to Terence McKenna so I couldn’t ask for more. Since listening to the Salon I have not only changed my own mind, and because of that I have begun to bring up issues and point out flaws in others grasp on reality or consciousness. Because not all of my friends (most raised on TV) have the concentration time span to read, or even listen for an hour. But I still try, and some will listen long enough to hear a McKenna DMT linguistic elf rap. The point I am trying to make is that I don’t necessarily need a new psychedelic community because I’m finding it is more worthwhile to turn the friends I already have psychedelic. That’s just my 17 year old point of view take on things. I’m sure it isn’t news to a Daniel Pinchbeck fan, but just in case you hadn’t heard…. He is doing a little US tour so check it out. I know I’ll be seeing him in Seattle. I don’t know what Lorenzo thinks about the upcoming 2008 presidential elections. But I’d like to think he is in support of Ron Paul. I know I am. Look up Ron Paul right now. And than vote Ron Paul. Unless he is a liar in which case please inform me. Hey Little Elf . . . thanks a million for putting up a MySpace page for the salon. I just took a quick look at it and plan to poke around a bit as soon as I get a chance. . . . as far as 2008, well, in 2004 I voted for Leonard Peltier, who was on our ballot out here in California. I don’t know about 2008, but for what it’s worth, I actually had the honor of voting for Ron Paul the very first time he ran for Congress. I was a young lawyer living in his district at the time, and way back then I saw what an impressive man he is. Among the current cast of characters who are running, I agree that he is the best qualified.